It should come as no surprise that Smith played one of the best innings of his career, a second-innings century on a rank turner that set up his team’s victory. Smith may have been put down more than once in the course of that knock, but the manner in which he approached batting, having a specific plan and the discipline to stick to it while shutting out all else was the single biggest difference between the run-making approaches of the two teams. With the 333-run win in the first Test, Australia gave themselves the best possible chance to retain the Border-Gavaskar Trophy. But, with so much cricket left to be played they will not be looking too far into the future. That has been the biggest difference between this Australian team and others who have toured before. In the lead-up to the series, there were no warnings about sledging. There were no predictions of what Mitchell Starc would do to India’s batsmen with his 150-kmh rockets. There were no tall claims of Australia rocking up and winning the series. The days of Glenn McGrath predicting a whitewash were well and truly behind us. If anything, Australia played down their chances. Nathan Lyon said he watched videos of R. Ashwin bowling for inspiration. Smith constantly reiterated that India’s batting line-up was one of the best in the world. Australia, however, had no interest, or time, to play mind games. Instead, they began their preparation for the tour of India with a stint at the ICC Cricket Academy in Dubai, something they had scheduled over six months in advance. Having struggled on their tour of Sri Lanka, Australia did not want to take chances, especially after their experience of touring India in 2013. Back then, India were careful to provide Australia with flat, batting friendly pitches in warm-up matches and net sessions, saving the rank turners for the actual Test matches. To combat this, Australia rocked up in Dubai, where Tony Hemming, the head curator at the ICC Academy, had worked out a reliable way to create different kinds of pitches. Hemming calls these hybrid pitches, and he was able to help Australia encounter not only the sharp turners but also pitches that were flatter and slightly lower in bounce. 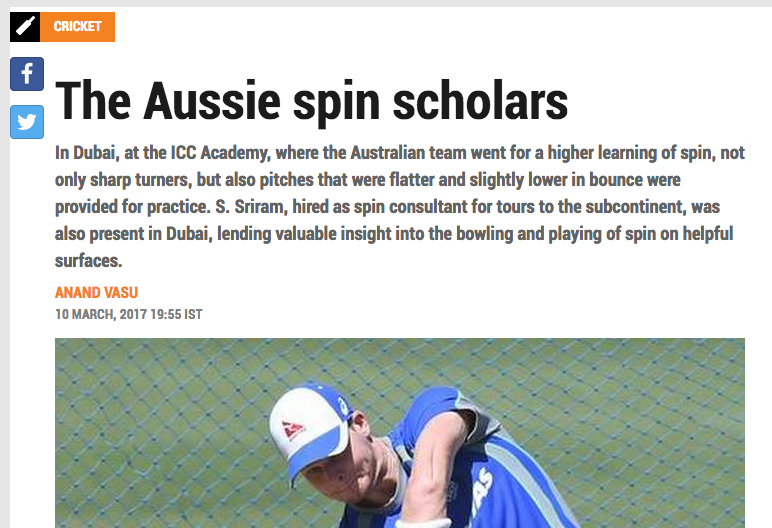 Sriram, hired as spin consultant for tours to the subcontinent, was also present in Dubai, lending valuable insight into the bowling and playing of spin on helpful surfaces. The preparation Australia put in allowed them to hit the ground running when it came to the first Test. India, at the end of a long season, having had success against New Zealand, England and Bangladesh on surfaces that were far more true than the one in Pune, were clearly thrown off their game. If Australia had been deliberate and precise in their preparations for the India tour, the home team was not best served by victories on good surfaces. It was not as though India did not train hard enough, or prepare with less intensity than the Australians, but certainly they were not pushed as hard, being more used to the conditions at home. Sometimes, the difference between two teams at the highest level can boil down to little things such as these, as India saw in the early part of this series.